All fighting within cities and all bombardments of urban spaces, even the most "precise and surgical", is a potential death trap for civilians. Consequently, the permeation of war into cities inevitably transforms their inhabitants into potential human shields. For Palestinians living in Gaza today, simply spending time in their own homes, frequenting a mosque, going to a hospital or to school has become a dangerous enterprise since any one of these architectural edifices can become at any moment a target. One can no longer safely assume that the existence of masses of human bodies – even the bodies of children – in civilian spaces can serve as defense of the weak against the lethal capacity of the hi-tech states. But since hi-tech states can and do kill hundreds or thousands of civilians, they have to provide moral justification for their action in order to preserve their standing in the international arena; they have to demonstrate that they are protecting the principles of liberal democracy. It is precisely within this context that we should understand the series of posters recently disseminated by the Israeli military through its Twitter account, Facebook and blogs. The poster "Where do Gaza Terrorists Hide Their Weapons" is a paradigmatic example, where the subtext does the speaking: Houses, mosques, schools, and hospitals are legitimate targets because they are presumed to be weapon depositories. This is also the message in "When Is A House a Home?" which simply zooms in on one of the images in the previous poster, showing how Palestinians presumably hide rockets in civilian homes. The logic is straightforward: insofar as Hamas hides weapons in houses (illegitimate), Israel can bomb them as if they were military targets (legitimate). Within this framework, a single function (hiding weapons) out of many existing functions (home, shelter, intimacy, etc) determines the status of an urban site (in our case the house), so that the edifice's form loses its traditional signification. The question "when does it become a legitimate military target?" is merely rhetorical. 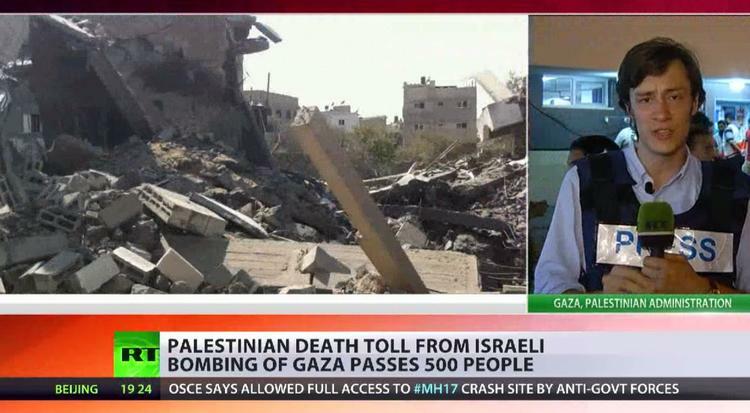 Its real meaning is: "All houses in Gaza are legitimate targets" since all houses are potentially non-homes. Not unlike colonial as well as other vastly asymmetrical wars, Israel's legitimization for its indiscriminate bombing is premised upon a profound moral disjuncture between Israelis and Palestinians. In the poster "Israel uses weapon to protect its civilians. Hamas uses civilians to protect its weapons", Palestinians are depicted as barbarians who ignore the elementary grammar of international law. Israel's warfare is, however, not only about the re-signification of architectural structures, but also about the transformation of human beings into collateral damage, subjects who can be killed without violating international law. This is the subtext of the poster featuring Israel's Chief of Staff saying: "Even as we carry out strikes, we remember that there are civilians in Gaza. Hamas has turned them into hostages." Again, the logic is clear. All civilians in Gaza are being held hostage by Hamas, which is considered a war crime and a gross violation of international law governing armed conflict. This, then, provides legal and moral justification against the accusation that Israel is the one killing civilians. Presumed human rights violations carried out by Palestinians against Palestinians – taking hostages and human shielding – thus become the legitimization of lethal and indiscriminate violence on the part of the occupying force. Hence, the use of human shields is not only a violation. In contemporary asymmetric urban wars, accusing the enemy of using human shields helps validate the claim that the death of "untargeted civilians" is merely collateral damage. When all civilians are potential human shields, when each and every civilian can become a hostage of the enemy, then all enemy civilians become killable. In order for all this to be convincing, the Israeli military depicts the asymmetric context in which it unleashes its violence against a whole population as symmetric. This is carried out, for instance, through the poster "Some bomb shelters shelter people, some shelter bombs". Here a radically disproportionate situation is presented as if it were balanced. The residents of Gaza are bombed by cutting edge F-16 fighter jets and drones, yet they do not have bomb shelters, and they have nowhere to flee. Israel's residents are bombed mostly by makeshift rockets, many of which have been intercepted by Iron Dome missiles. The majority of the population in Israel has access to shelters and can flee out of the rocket's range. These powerful images, spread by the Israeli military through social media, attempt to transform the very presence of civilians as suspect in the areas it bombards, regardless of the fact that the areas it bombs are urban centers. The crux of the matter is that in the context of contemporary asymmetric warfare, the weak do not have many options. When there are no bomb shelters, people remain at home during extensive bombardment. And if, like in the case of the Palestinians in Gaza, fleeing is not an option – because all exits from the strip have been closed, or because the neighbour's house is under the exact same threat as one's own, or because one is already a refugee and does not want to become a refugee anew – staying put, which the high-tech states term "illegal human shields," constitutes a form of resistance. Neve Gordon is an Israeli activist and the author of Israel's Occupation.